The Goodgame cheering taskforce had positioned themselves a few hundred meters from the start, and greeted their colleagues with a barrage of support that was hard to miss. 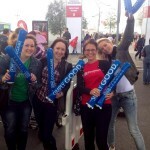 A combination of thundersticks in a brilliant company blue and motivating cheers ensured an impressive level of noise. Just before the end, there was another cheering squad, to help the runners dig deep and make it to the finish. Having arrived, our colleagues were reinvigorated with drinks, before some went off on a harbor tour, which was offered to all the runners for free. We have no doubt that we’ll be on the start line and ready to go again next year. Hopefully with an even bigger team!